Welcome to the Friends of SUBA Blog Hop. What does SUBA stand for? SUBA stands for Simply Unique Business Angels, and is run by Pip Todman and Louise Sims. Back in August 2017 I attended a SUBA Training Course to help move my business into the Social Media arena. Pip and Louise have welcomed me with open arms and are constantly helping others like me to understand the systems that they use and build the confidence to use them more so. There was another training course in February 2018, the group of Stampin’ Up! Demo’s who attended, decided to join up to create a blog hop so that what they had learnt could be put into practice. I was lucky to join this group and be able to show you what I have made for this month’s blog hop. May’s Blog Hop Theme – Annual Catalogue Pre Order. Being a Stampin’ Up! demonstrator enables me to see the new catalogue before customers and to order certain items that are available to pre-order. 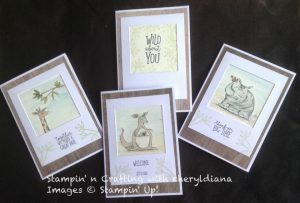 In this blog hop I have decided to use the Animal Outing stamp set. I stamped the images with Black Memento ink pad into watercolour paper. 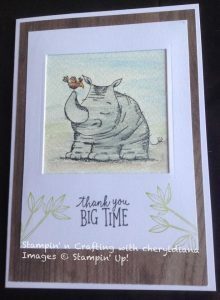 I coloured in the images using the Stampin’ Up! watercolour pencils plus the lemon lime twist from the Lots of Happy Card kit and an aqua painter. I love how this gives it a subtle look. After seeing other social posts I thought I would make a photo frame around it to make it look like the photo had just been taken. 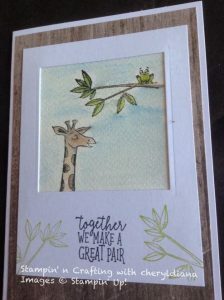 For this I used Whisper White card stock and the largest die from the Square die set. Lemon Lime Twist was used to stamp the leaves on the white frame. My next step was to decide what to use as a back ground, I wanted it to look like the photo was stuck to a wall or board so I chose the Wood Textures 6×6 DSP that has been carried over to the new annual catalogue. I love this DSP as it can be used for so many things. 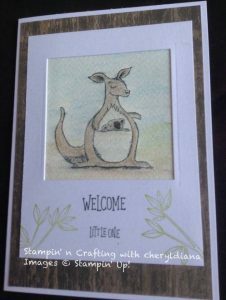 As you can see I have almost finished the next card but there is a space under the stamped image that just needs that little something. My challenge is to let me know what you think this card needs to finish it. Thank you for reading my blog. Please do leave comments. When you are ready please clink onto the next button to take you to Deborah to see what lovely projects she has to show you. These look like framed art pieces. They would look darling in a baby nursery!